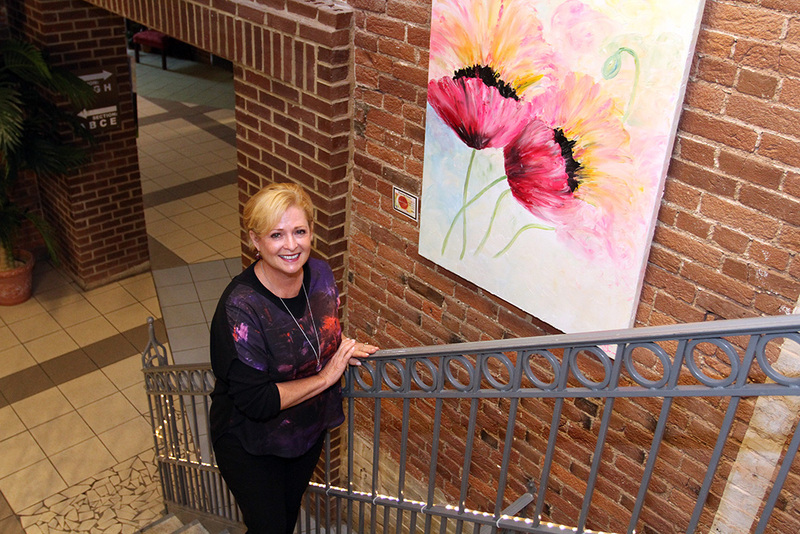 A career she started later in her life, local painter Bobbi K. Samples has gained recognition in the Indianapolis area in the past several years for her large-scale, semi-abstract, very colorful works. 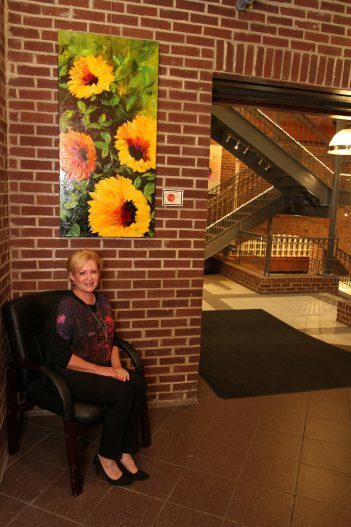 As the artist in residence at The Mill Top Banquet and Conference Center in downtown Noblesville for the past three years, she’s transformed the blank brick walls of the historic building’s mostly brick interior to match its upscale events. Samples still keeps her studio in her home, about one mile north of downtown. At around age 50, she began her career as an artist. From there, the rest is history. Samples has been showing at The Penrod Arts Fair since 2004, the same year she began painting. In 2017, she was accepted into Penrod’s Friday Night Gala, a first for her since the VIP event began approximately five years ago. “I painted 85 paintings in my first year. I just couldn’t put it down,” she said. “They weren’t all good, but that’s how you learn. 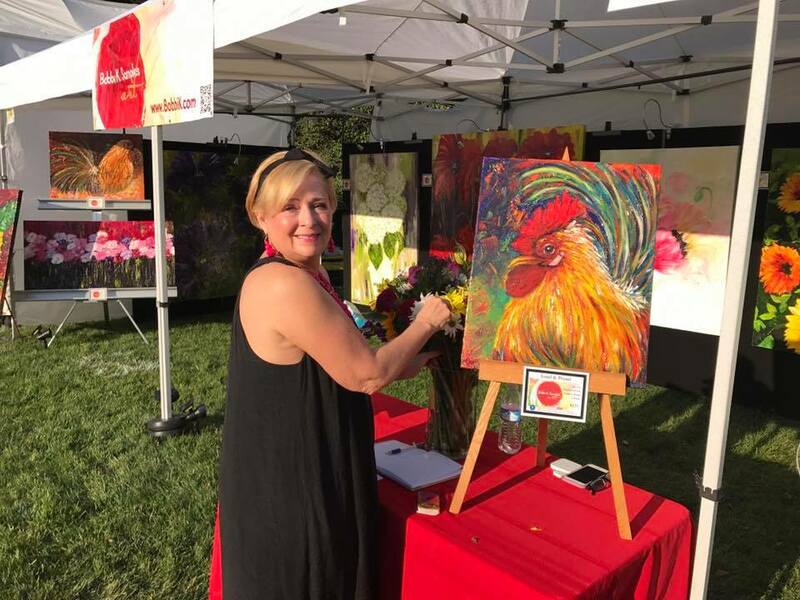 Samples said she considers herself a pretty prolific and fast painter when she sets her mind to it, and that one reason it takes her as long as it does to complete works is the drying time of oil paint and her use of palette knife over brush, which leaves paint much thicker on a canvas. Bobbi K. Samples at the 2017 Penrod Arts Fair. Born in Washington, Bobbi K. Samples’ father was in the U.S. Air Force, and her family lived all over the world. Samples is married to John, CEO of the Christian Holyland Foundation. Together they have two children. Son Shayne is married to Joelle. Together they have a 1 year old. Daugher Alain is in the Indiana National Guard. A major and former Blackhawk pilot, she is currently at command and general staff school in Ft. Leavenworth, Kansas. Samples also is a real estate broker for F.C. Tucker and owns an OSHA compliance consulting company, The Safety Firm, which she began in 2009.